So even though he was being “real’ it wasn’t actually real—but none-the-less—what a realization. Imagine coming to the end of yourself with nothing on the other side except a will to live—to simply exist. And as the last bit of air drained from your resolve to survive, you decide to end it all, but you can’t even seal the deal. Chuck’s hope was left shriveled and he tried unsuccessfully to commit suicide. The only true end of life is despairing without the presence of God in it. Though his choice wouldn’t be based a concept of God, it isn’t a choice without hope. After having lost the “love of his life,” Chuck’s hope is renewed when he meets an attractive red head while standing in the middle of the 4 paths laid out before him. Whether or not your cross roads includes a red head of hope, a life apart from submitting to the protection and control of the One true God is a wasted life. To be surrounded by all of the beauty of this world that is GOD and to be totally unaware that God is the masterful creator of it is a travesty. More than that, to miss the hope that God lovingly offers to us is to miss the meaning of life itself. Illness – Will my sister ever get well? Death – Why did my Momma have to die so young? Loss of job/income – How am I going to pay the bills and feed the kids now? Simply put, we want stuff to go our way. When stuff doesn’t go our way, we bristle. We fight. We resist. We would rather object to God’s control than to be an object of His control. Trust is at the core of yielding control to God. When we strip off all preconceived notions of why we struggle with things beyond our control, we uncover that we simply Don’t.Trust. God. We want to trust Him, but our fear that things won’t go the way we want uncovers the confidence we have placed in something or someone other than the one true God. 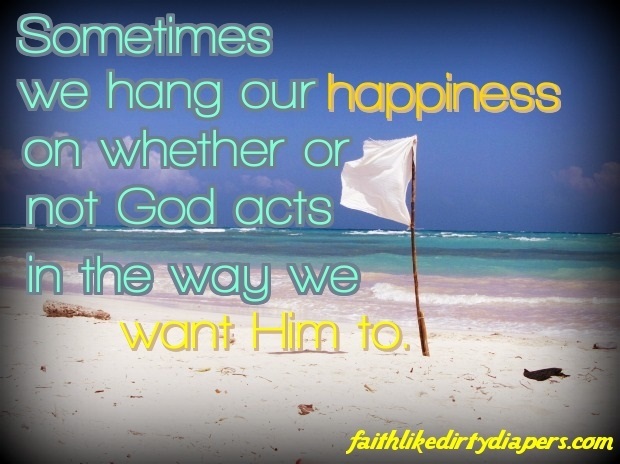 Sometimes we hang our happiness on whether or not God acts in the way we want Him to. Ultimately, if we hope in the “good” we want as opposed to the “good” God is working in our lives, we get stuck in idolatry. But it’s so easy to succumb to the temptation to worship our own plans, because let’s face it—sometimes what is for our “good” is actually…well…BAD. But what if we could throw our own ideas about what is “good” in life to the wind? we could really believe that “beauty comes from ashes” no matter what the ashes are made of? we could open our hands and offer what already belongs to God anyway? I’ll tell you what will happen. 1Peter 5:6-7 Humble yourselves, therefore, under the mighty hand of God so that at the proper time he may exalt you, casting all your anxieties on him, because he cares for you. We can humble ourselves before God and throw our worries on His shoulders, because He cares for us and He is for us. So many times, when the tough stuff comes, we think He is against us. But He is working something greater in you than you could ever grow on your own. He is developing each one of us to be a shining beacon of hope to the world. And He knows just what it takes in each of our lives to accomplish it. And He doesn’t leave us without hope. Chuck had to find a red head to renew his hope in life. All we need is to remember the precious blood of Jesus that was shed to pay our sin penalty before God. In Christ we are restored in life and in death. No matter where we go or what we do, the hope we have set before us in Christ is fixed, and we can trust Him with every detail of our lives—even the reigns of control. There are so many thoughts you can have from the scriptures to help you bolster your trust in the Lord by renewing your hope in Him:. This entry was posted in Freedom in Christ, Trusting God and tagged broken, control, trust. Bookmark the permalink. Even a diaper change… Yep God is in control. Love it especially followed by do not fear, only believe. I came to your site from our Compel Iron Group. I love that you’re finding God in everything that you do, and sharing the joys and sorrows. This post really spoke to me as I’m sometimes a control freak. I am detail oriented, so the not knowing often unnerves me. But I know we serve a higher God, who is loving and giving. I really love the way you put it that we should not object to His control, but be object of it. That is such a powerful turn of phrase.